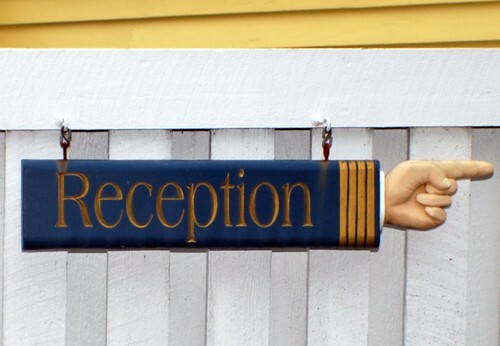 My recent trip to a beautiful bed & breakfast inn located in Kennebunkport, Maine was really supposed to have happened almost nine years ago but a trip that was planned for October of 2002 unfortunately never happened. At that time, I was head-over-heels back in love with the guy who'd had my heart tied in knots for years and it seemed that after 17 long years, we were finally going to be together as we made plans for his very first trip to New England. One of John's priorities during his visit was to be a trip to Maine for a chance to see a coastline as different from that of California as possible so I spent a lot of time searching for what I wanted to be the perfect place to stay and that's when I came across the Captain Lord Mansion. Just looking at their website, I knew I had found the ideal spot and made reservations only to have to cancel them a few months later when life threw yet another curve ball and things got complicated once again. As my heart broke for the third and final time, I vowed that someday I would still go stay at the Captain Lord Mansion even if I had to go by myself. Not quite nine years later I finally got that chance. As I made the 175-mile drive from Norwich to Kennebunkport I couldn't help but think that this wasn't the way that it was supposed to be but over the past 8+ years I'd had plenty of time to accept that it was a trip that I'd never make with John and I'd had lots of time to fall back, regroup, and repair my heart. 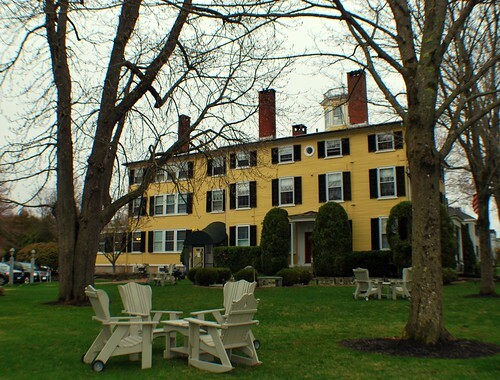 Even though there was going to be a small "ghost" going along with me on this trip, I thoroughly planned on enjoying my time away at one of the "most romantic Bed & Breakfasts in Maine" even though I was going there alone. Better alone than not at all, right? As you might expect, though, the story of the Captain Lord Mansion starts a lot more than nine years ago. Our story begins almost 235 years ago with Nathaniel Lord, the second son of Lieutenant Tobias Lord and Mehitable (Scammon) Lord, who was born June 1st, 1776, at Moulton's Mills in Sanford, Maine. 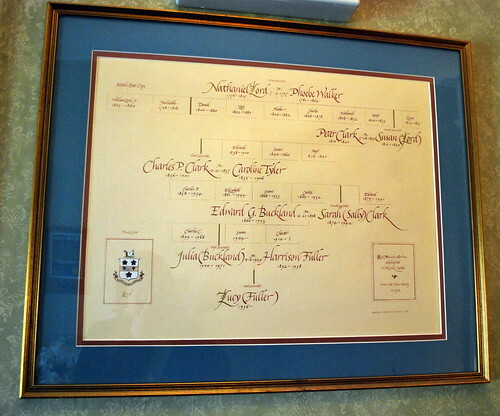 On July 2nd, 1797, 21-year old Nathaniel married 16-year old Phoebe Walker, the daughter of Captain Daniel Walker and Lois (Stone) Walker of Arundel. 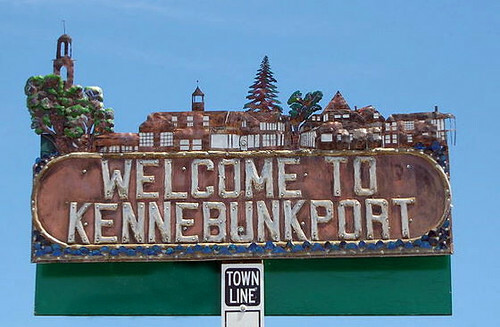 The young couple settled in Kennebunkport where Nathaniel was a shipbuilder and they then proceeded to have eight children from 1798 to 1814: Mehitable Scammon Lord, 1798; Daniel Walker Lord, 1800; Lois Walker Lord, 1802; Phoebe Lord, 1804; Charles Austin Lord, 1806; Nathaniel Lord, 1808; Betsey Watts Lord, 1810; Susan Lord, 1812; and Lucy Jane Lord, 1814. In addition to his children with Phoebe, Nathaniel also had an illegitimate son with his housekeeper Sarah Estes Day when William Lord, Jr. was born on September 3rd, 1803. Needless to say, with all of those children, the family was in need of a big house! "... was a business man of excellent standing, and was noted for his remarkable memory. It is said that he kept no account books, but carried the details of his large shipping business in his head, meeting all obligations promptly. Records in the old Custom House at Kennebunkport, dating from 1800, make mention of Mr. Lord's name as consignee of various cargoes received from many different ports in the West Indies, and also some from Liverpool, with additional information as to duties imposed, tonnage of vessels, and other interesting statistics regarding the shipping of those early days. His ships, the largest being about 250 tons, brought iron, coal, salt, etc., safely to port when the enemy's ships-of-war were already on the seas in search of American commerce. Mr. Lord built a large mansion house at Kennebunkport during the War of 1812-14, chiefly, it was said, to furnish work to otherwise unemployed ship carpenters." With his shipwrights sitting idle due to the imposed British blockade, Nathaniel decided to put them to work building him the most impressive home in the area. In order to achieve that goal, Nathaniel chose the famous housewright/architect Thomas Eaton to design his mansion. Eaton had previously designed another home in the area for William Taylor, a successful Kennebunk merchant. 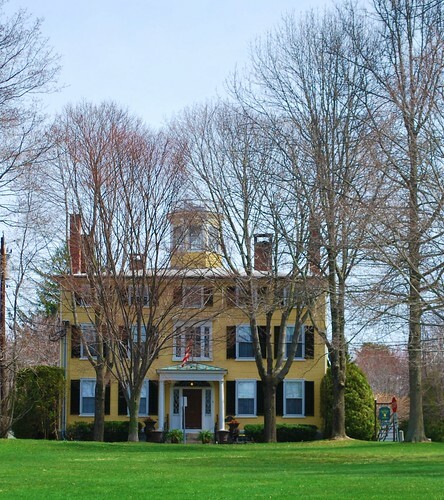 The Taylor-Barry House, designed in 1803, is a great example of the Federal Style architecture that was prevalent during the heyday of Kennebunk's shipping industry and I'm sure it's design was what prompted Nathaniel to engage Eaton as architect and dream of an even more impressive home. Unfortunately, Nathaniel didn't get to enjoy his grand house for very long as he died on February 24th, 1815 (most likely from influenza) at the young age of 39. His wife Phoebe - who had popped out a baby just about every two years - lived on for another 49 years and the house stayed in the family for another four generations until great-great granddaughter Julia Buckland Fuller sold the house to a gentleman who would eventually sell the house to Rick Litchfield and his wife Bev Davis, current owners and innkeepers of the Captain Lord Mansion. Refugees from the corporate world of advertising, Bev and Rick found themselves in Kennebunkport on Saint Patrick's Day in 1978 staring at the 3-story Federal Style former home of Captain Nathaniel Lord and his family knowing that they just had to own it. At that time the mansion was being used as a home for elderly ladies though it was properly licensed for the rental of 16 rooms as well as serving meals to guests which seemed to fit the bill perfectly for their goal of owning an antique-filled, intimate bed and breakfast inn. On June 15th, 1978 the couple closed the purchase on the 20,000-square foot mansion and began the sizable task of renovating the building into a first-class country inn with five of the seven senior ladies staying on as residents during the process. Neither Bev nor Rick had any experience in running an inn but I'm pretty sure they could have fooled anyone as they completely renovated the mansion and made it into one of the finest destinations in all of New England. The couple is going on close to 35 years as innkeepers while the mansion nears it's 200th anniversary in 2012 when an entire year of special events and activities is planned. Now, of course, I didn't know any of this back in 2002 when I was first planning on staying at the mansion. I just knew that it looked absolutely gorgeous and plush and luxurious and like the perfect place to spend time with the person you love. Having now spent a night there I can tell you that I was right on all counts as even though I have no one who loves me in a romantic-bed-&-breakfast kind of way, I met a lot of guests who did and they couldn't have looked happier or more in love if they'd tried. While I'm sure they can attest to the "perfect place to spend time with the person you love" aspect, I can most definitely attest to the "gorgeous and plush and luxurious" aspects! And you can bet that if I ever do meet someone who loves me in a romantic-bed-&-breakfast kind of way that I'll be hauling him directly up to Kennebunkport! Even though I've hopefully got your curiosity piqued as to what makes the Captain Lord Mansion such a marvelous place, I'm going to make you wait just a little longer until I show you around the house as there are just too many wonderful little details and pictures to cram it all into one post. Just remember - "good things come to those who wait" and I promise you that it will be worth the wait ... just like it was worth the nine-year wait that I endured before I had a chance to spend a night in one of the most luxurious places I've ever stayed. Wow, that inn is just beautiful, and a perfect place for a Duchess. I'm glad you were able to get there and have a wonderful visit. 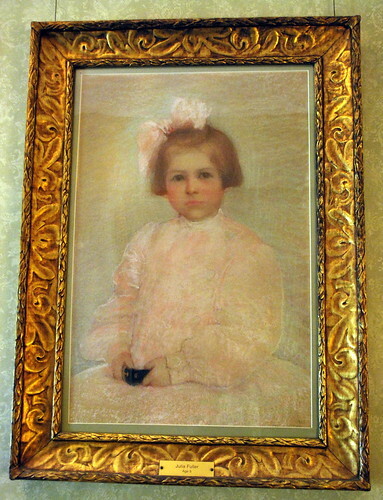 Is the portrait of Julia his great-great granddaughter? Poor Phoebe! Although she must have been a strong woman. Good for you going there on your own. I hope your "little ghost" didn't cause you too much discomfort. Sign me up! I would love to visit this fab place with my sweetie. I look forward to the rest of the story. Your description makes me almost want to rescind my vow never to return to Maine on vacation! (There was an incident, years ago, when the black flies swooped in and carried off the chihuahua...I miss that dog.) Love the history and can't wait to read more! So you can thank the British for the creation of such a lovely place? I will take the credit hehe. I love finding out about homes that are so different to the ones built in the UK, but are equally beautiful! I love everything about Maine, when it is not winter, of course. I love their lawn furniture and can't wait to see the rest of it! Gorgeous place! I love the way you round your way round the personal story as you drove through those memories as well. 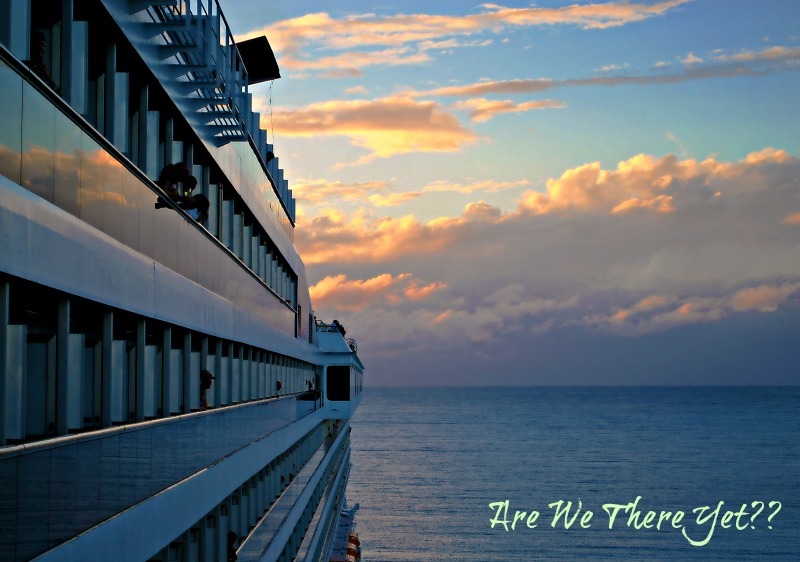 Maybe this leg of your journey was bittersweet, but I'm betting the next portion is going to be the best EVER when you will make a new memory with the man who has been looking for YOU. More more more on your trip. Puuuuhleease!! I'm so pleased you enjoyed your visit and stay, even if you did take a small ghost with you. Glad you went... not sure how I feel about all the negative connatations that seemed to have followed you there. Hope you found solace, learned to enjoy your own company and refreshed your soul while you were there. No ghosts! So this is the place you and John were going to enjoy. It makes a lot more sense now. I'm going to read the next installment right now. Hugs.